As temperatures dance cruelly around the single digits, Vermonters have good reason to scurry to the nearest movie theater. Soothingly warm cinemas and buckets of popcorn aren't the only reason to take in a film, though: As it happens, quite a few unusual and intriguing films are coming to Vermont screens this week. The public is invited to attend a free screening of and discussion about the new documentary A Path Appears, which addresses the subject of forced prostitution in America. Filmed as part of the PBS series "Independent Lens," A Path Appears was made with the participation of Nicholas Kristof and Olivia WuDunn, authors of Half the Sky: Turning Oppression Into Opportunity for Women Worldwide. Other participants in the film include actors Malin Akerman, Jennifer Garner and Mia Farrow. Johnson State's Stearns Student Center will host the 7 p.m. screening as part of PBS' monthly Community Cinema program, the purpose of which is to encourage local discussion of important issues. Also on Tuesday evening, Burlington cinephiles will have a tough choice to make. Two free screenings of top-notch films compete for locals' attention. The Burlington Film Society's Architecture and Design film series continues on January 20 with the 1997 film First Person Singular: I.M. Pei, a documentary about the renowned modernist architect. The 6 p.m. screening is free at Burlington City Arts on Church Street in Burlington. A bagel shop is an unlikely venue for a film festival, but I've seen weirder. Hell, I once projected some films from the hood of an old Buick in a classic-car dealership in Minneapolis. So if that kind of thing doesn't throw you, visit Feldman's Bagels on Pine Street in Burlington at 7 p.m. for the first installment of the Frog Hollow Film Series. The kickoff film from the venerable local craft center is Craft in America, a PBS documentary about the enduring significance of small, handcrafted objects. 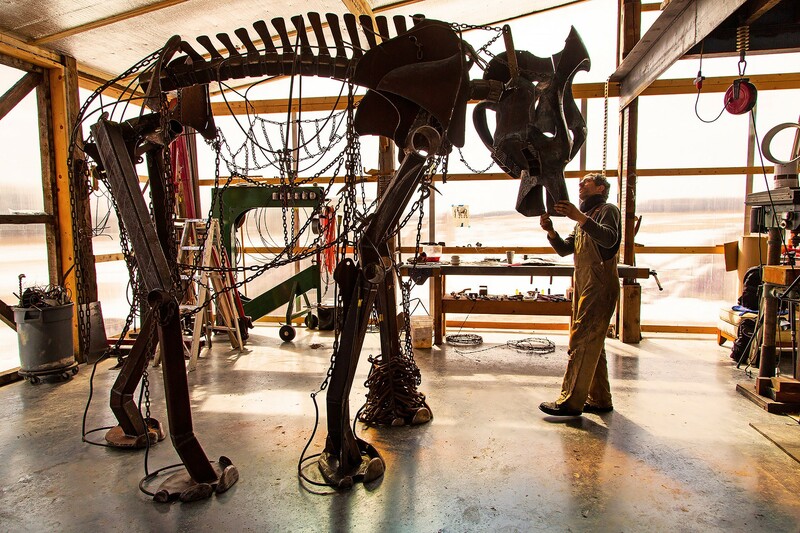 Craft in America will be preceded by a screening of the short documentary "The Eben Markowski Elephant Project," about the creation of a full-size elephant sculpture at the Shelburne Museum. Filmmaker Natalie Stultz, Markowski and woodworker Kit Clark will be present for a post-film Q&A. This one is free, too. At Jericho's Deborah Rawson Memorial Library, the Jericho Energy Task Force's free winter film series begins at 6:30 with a screening of Trash: No Place for Waste, a multiple-award-winning documentary about the ever-growing masses of garbage that litter the Earth. This screening practices what it preaches, as it were. The "waste-free" event will offer free popcorn and cider to attendees, but organizers request that viewers bring their own cups and bowls. Furthermore, the Chittenden Solid Waste District, which is cosponsoring the film, will raffle off a number of prizes including a backyard compost bin. A vitally important cinematic event is coming soon and merits everyone's immediate attention. I'm referring, of course, to Planet Cat: The aCATemy Awards, the second annual installment of which will alight at Williston's Majestic 10 Cinemas on April 12. Fans of cinematic kitties need not start lining up for tickets yet, but cat owners with directorial aspirations can submit their entries to this festival until March 14. Run by the Humane Society of Chittenden County, Planet Cat will accept humorous, cute or otherwise adorable cat videos in three CATegories: six seconds, 15 to 30 seconds, and one to two minutes. Check this space for updates. Should anyone want to participate in this festival but find themselves somehow catless, my own two kitties, Ira and Potato, are available for hire. Be warned, though, that they are both divas, and their contract riders require that you remove all tuna-flavored treats from their dishes. Not because they don't like them; just because cats are like that. Trashed is not showing in any theaters in the area.